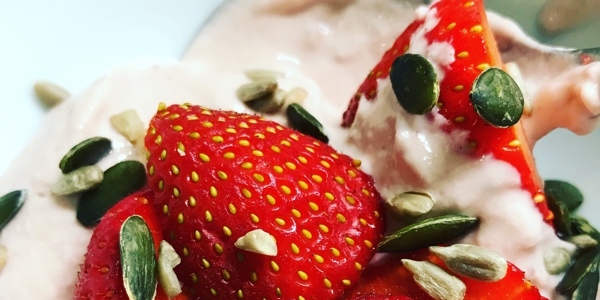 Upgrade Your Yoghurt - What to Eat Natural Yoghurt With? 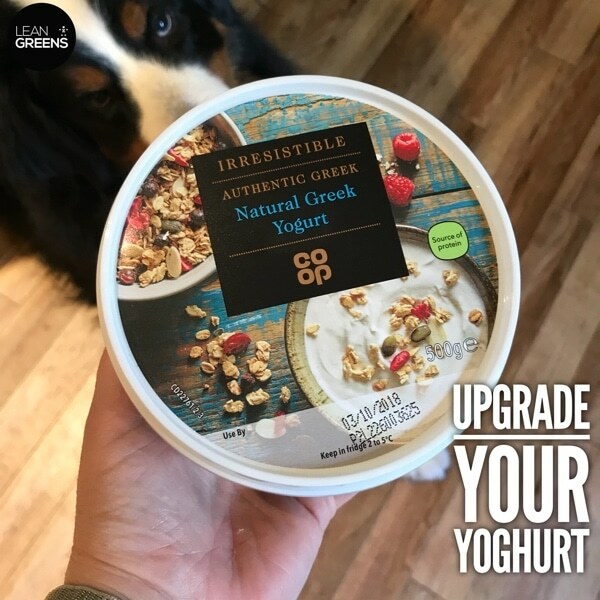 Today we show you the differences with yoghurts you can buy and how you can upgrade natural Greek yoghurt with so many options. To start with, I just want to talk about what yoghurt you commonly find in the stores. It’s a huge product category with lots of options. Now, I would normally always go for the luxury flavoured type Yoghurt. I’m not having a go at any particular retailer here, but a seemingly “plain” vanilla Yoghurt contains a load of sugar in it because that’s how they make it taste really good. Then you’ve got your light and free, zero percent fat, zero percent sugar versions. But when you look at the ingredients, they have no added sugars but they have other sweeteners in there and they have a lot of ingredients that you wouldn’t normally think you find in Yoghurt. 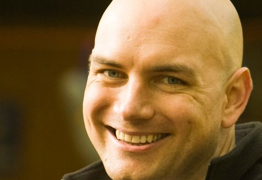 The ingredient you should find in Yoghurt is milk, and that should be it. Co-op. Authentic Greek, Natural Greek Yoghurt, it’s amazing. I normally only shop at Sainsbury’s, but there happens to be a Co-op local to me and I’m blown away with some of their own made stuff, it’s really good quality. Instead of buying flavoured Yoghurt, there are so many things you can add to your Yoghurt because let’s face it, eating plain Yoghurt on it’s own isn’t very exciting, but this is. 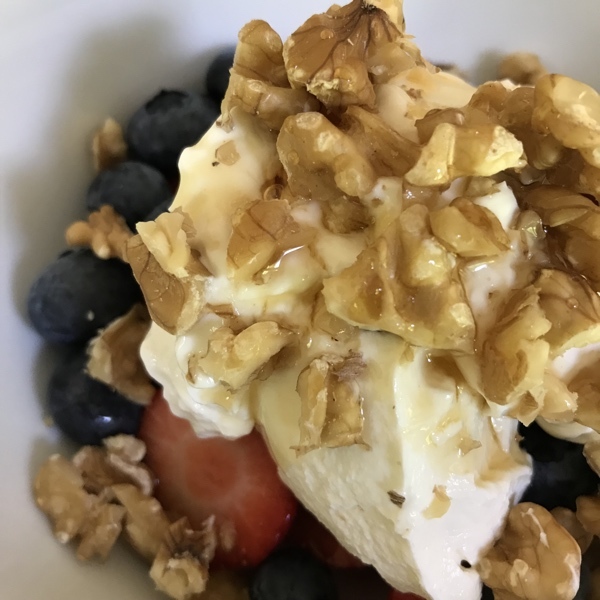 So you could add your porridge oats to Yoghurt, obviously you can use things like maple syrup if you want a little bit of a sweetness, or honey, raw honey is awesome. Chia seeds, I know a lot of people are really into chia seeds. Then there’s your normal kind of seeds, pumpkin, sesame. Tinned fruit, I always have tinned fruit in the cupboard because when I was little if I didn’t feel very well my mum would serve me tinned peaches, I still kind of do that when I’m feeling a bit under the weather, it’s a nice comfort food. Sultanas, banana, Yoghurt and syrup would go along with that, and cinnamon, another nice thing to add, or nutmeg. 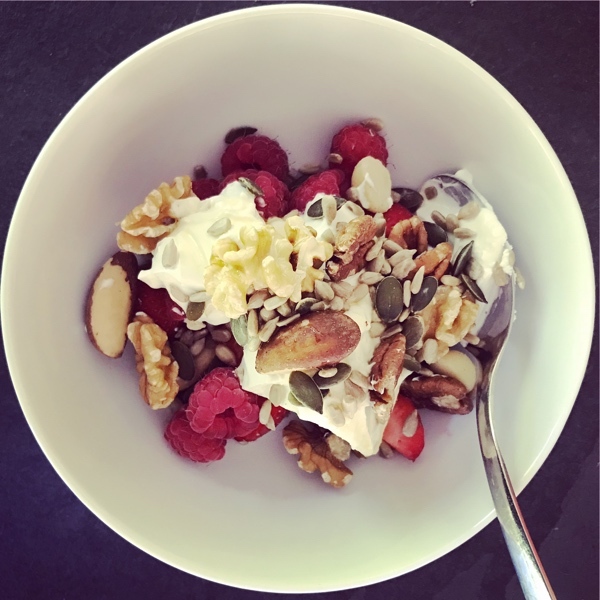 If you want to go a little bit tropical try adding a little bit of coconut cream to your Yoghurt and giving it a good stir around, it just gives you a different flavour, have maybe some pineapple with it, it’s almost like being on a desert island. You’ve got your nuts, things like flax seed, you can add peanut butter, my favourite, ground almonds? Then obviously this is all in your cupboard, this is before you even get to the fresh fruit you might have in the fridge. So one final tip on what you could also do with your Yoghurt is, if you have a protein powder in the house. 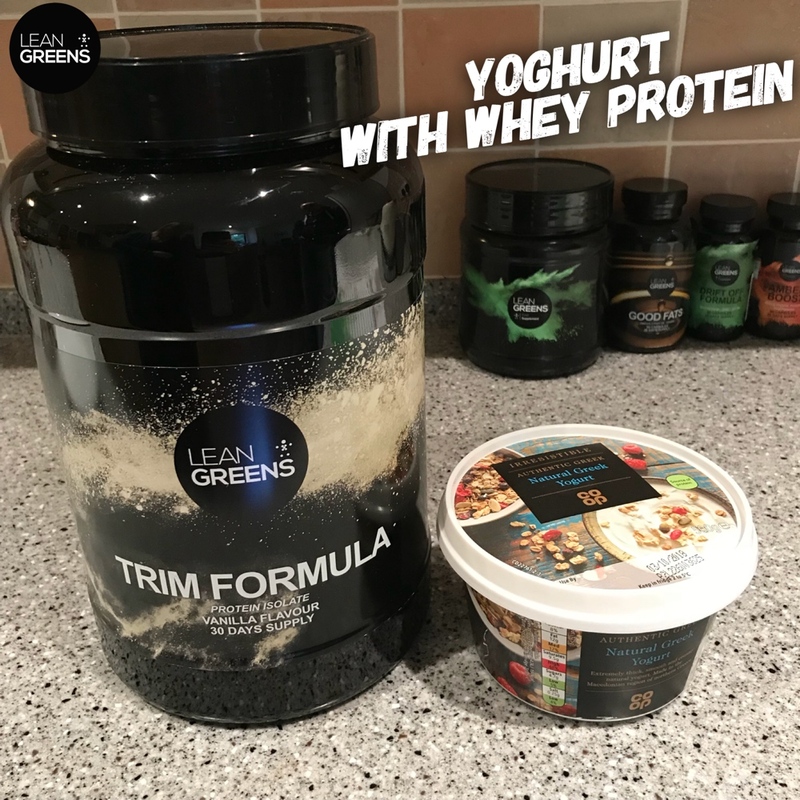 Our latest one, TRIM protein is vanilla flavour. If you add a little bit of protein powder to Yoghurt, you basically come up with a vanilla flavoured with the extra protein from the protein powder. A little bit of Yoghurt, simply stirred in with the protein powder and it mixes really very well. Doesn’t look like it’s going to … but if you had all that with some fresh raspberries, or strawberries. It’s basically, exactly the same as the vanilla Yoghurt, but with good quality whey protein and good quality Greek Yoghurt. To be honest, I reckon you could use that and make a cheese cake. I might have to test that out. I think you could do like a crushed base with, like crushed nuts on the bottom and then like that mixed up and some fruit on top. It’d be like little mini cheesecakes. So, that’s some ideas of how you could upgrade your Yoghurt. If you can take a photo, put it below with #upgradeyournutrition, let us know your ideas. Like I said that’s literally what’s in my cupboard, you probably have some other things I’ve not thought of. Share a photo below and if you don’t have a copy of our “Upgrade your Nutrition” checklist, just leave a comment on our Facebook Page and we'll sort you out with a copy.